Traveling three times faster and with greater safety than planes operating in the ordinary air lanes, great air liners of tomorrow will drone through the purple darkness of the stratosphere to connect the principal cities of the world in the space of a few hours, is amazing prediction of Prof. Piccard, conqueror of the upper atmosphere. The greatest obstacles to be overcome, protection against extreme cold, low atmospheric pressure, and the dangerous sun’s rays, will likely be conquered by a plane having the features of the ship illustrated in the artist’s drawing above. 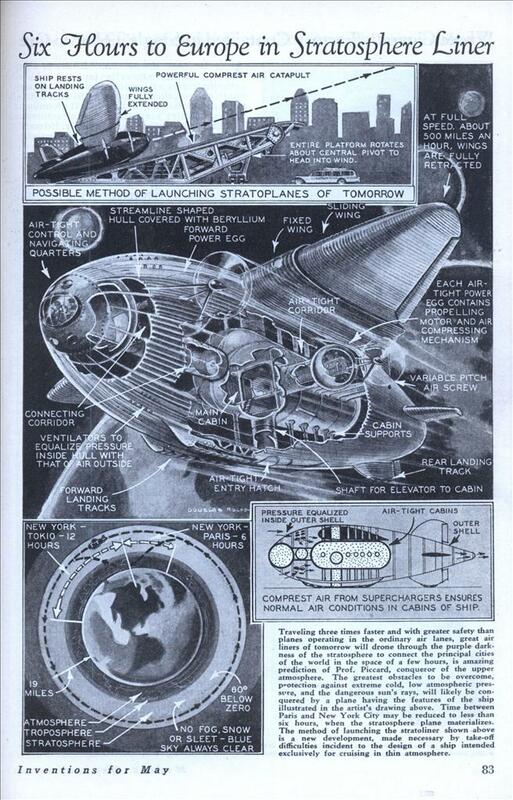 Time between Paris and New York City may be reduced to less than six hours, when the stratosphere plane materializes. The method of launching the stratoliner shown above is a new development, made necessary by take-off difficulties incident to the design of a ship intended exclusively for cruising in thin atmosphere. Wonder what they would of thought of the boeing 747 and 777 that runs that route many times a day in 6 hours and 30 minutes today or the Concorde that ran that route in just over 3 hours! Its amazing that only 75 years have passed. Sad to see the marvel that was the concorde retired making commercial aviation take a step back speedwise. My own thought while reading this is that whoever came up with the concept of this strato-liner was aware of the issues – but was working WAY too hard to overcome them. Low air pressure, yes, cold, yes, but both of them reasonably easily overcome as by-products of the engines used to power the craft. This reminds me of the Victorian attempts at spacecraft design that had more of a relation to ironclad steamship design than aerodynamics and an understanding of the actual environment to be occupied. That’s a common occurrence, isn’t it? I remember reading an article (it might have even been on this website) about how inventors in the 1930s were trying to improve AM radio reception by broadcasting different channels on separate frequencies, by using single sideband, etc. The answer was FM radio. The idea of varying the wingspan to provide maximum lift at takeoff and low drag at cruising speed is interesting. Modern aircraft use flaps to achieve the same end. I would think that the wing extension mechanism would be extremely heavy. Aside from this, the short span configuration would also suffer from high induced drag at subsonic speeds. 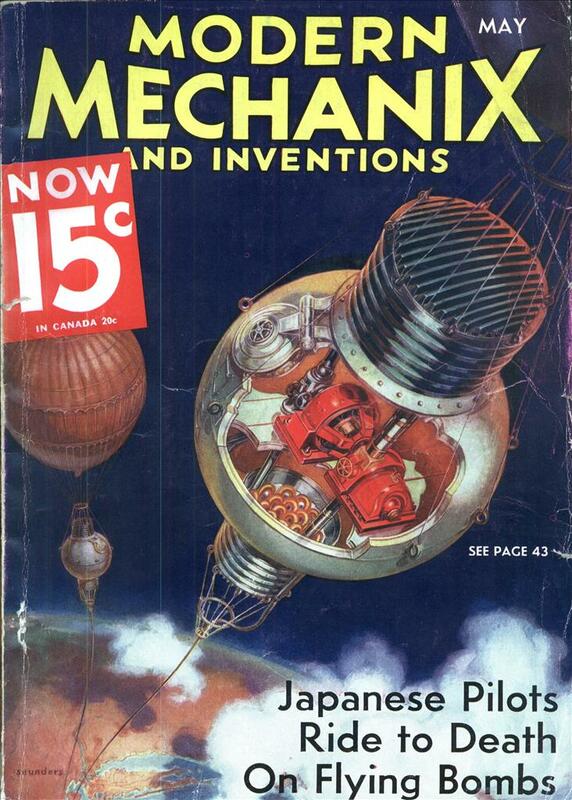 Another point of interest is that high strength aluminum alloys were in their infancy when the article was written. This is presumably why the plane is constructed from beryllium. At the time, the toxic properties of this metal were not fully understood. This metal did not become available in quantities until the 1950s and cost over $300 per pound in 2001 (http://en.wikipedia.org…). Did anyone else catch the good professor’s name? Pretty much cool.